Summer is here! Time for pool parties, BBQs and basking on the beach. With new summer scents, white-hot fashion and balmy lip balm, we have everything to kick off those long lazy days and sizzling sultry nights! Page 10 - Rock the Frock! The four dresses you need to sail through the season in style. Page 136 - Get Fresh! Fill your home with the sweet, refreshing scents of summer. Page 138 - Summer Survival Guide. Summer refreshments for your senses and tips to help every body beat the heat while looking fabulous. Who doesn't love a light flowy top for summer? The Fancy Floral Peasant Top is going to make frequent appearances in my summer wardrobe. 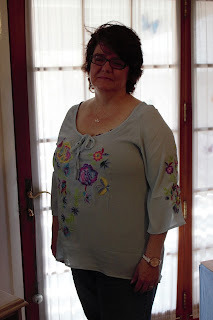 It has a relaxed fit and a breezy, crinkly fabric. You will want a tank or cami underneath, but with all the bright fun colors in the embroidered flowers you're sure to have just the right color cami in your wardrobe already. Another great piece to have in your closet for summer is a long, lightweight skirt. 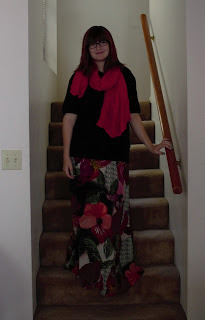 The Mark Orchid Show Maxi Skirt is just that skirt. The two layer skirt is the perfect compromise between a midi and a maxi length skirt. The under layer is a solid pink skirt that falls right at the knee for modesty and the floral printed top layer falls right at the ankles. As much as I would love this skirt for myself, my Daughter got to claim this one since it's a Junior Size item. Summer calls for quick and easy, no mirror needed makeup for those summer days on the run. The True Color Lip Balm is the perfect combination of moisturizing lip balm with a hint of color. The non-waxy balm provides 4X the hydration of typical balms and is never gritty or sticky. Mark Magalog 7 features head-turning fashion trends and heat-beating beauty essentials. Who doesn't like a great clearance sale. 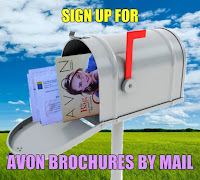 The Avon Outlet has all the very best of our products from previous seasons. See something you like? Get it quick! All items in the outlet are while supplies last. Check out the Spring Savings and Star-spangled savings flyers for even more special deals on makeup, fragrance, jewelry, and personal care.